"Ocelli" redirects here. For the eye-like marking, see Eyespot (mimicry). Some jellyfish, sea stars, flatworms, and ribbonworms  bear the simplest eyes, pigment spot ocelli, which have pigment distributed randomly and which have no additional structures such as a cornea and lens. The apparent eye color in these animals is therefore red or black. However, other cnidaria have more complex eyes, including those of Cubomedusae which have distinct retina, lens, and cornea. Dorsal ocelli are light-sensitive organs found on the dorsal (top-most) surface or frontal surface of the head of many insects, e.g. Hymenoptera (bees, ants, wasps, sawflies), Diptera (flies), Odonata (dragonflies, damselflies) and Orthoptera (grasshoppers, locusts). The ocelli coexist with the compound eyes; thus, most insects possess two anatomically separate and functionally different visual pathways. One common theory of ocellar function in flying insects holds that they are used to assist in maintaining flight stability. Given their underfocused nature, wide fields of view, and high light-collecting ability, the ocelli are superbly adapted for measuring changes in the perceived brightness of the external world as an insect rolls or pitches around its body axis during flight. Corrective flight responses to light have been demonstrated in locusts and dragonflies in tethered flight. Other theories of ocellar function have ranged from roles as light adaptors or global excitatory organs to polarization sensors and circadian entrainers. 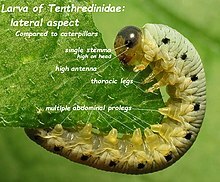 Although stemmata are simple eyes, some kinds, such as those of the larvae of Lepidoptera and especially those of Tenthredinidae, a family of sawflies, are only simple in that they represent immature or embryonic forms of the compound eyes of the adult. They can possess a considerable degree of acuity and sensitivity, and can detect polarized light. 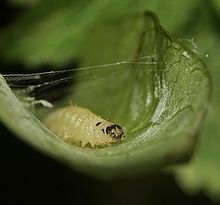 In the pupal stage, such stemmata develop into fully fledged compound eyes. One feature offering a clue to their ontogenetic role is their lateral position on the head; ocelli, that in other ways resemble stemmata, tend to be borne in sites median to the compound eyes, or nearly so. In some circles this distinction has led to the use of the term "lateral ocelli" for stemmata. Epidermal growth factor receptor (Egfr) promotes the expression of orthodenticle [and possibly eyes absent (Eya) and as such is essential for simple eye formation. ^ "Catalog - Mendeley". www.mendeley.com. Archived from the original on 24 March 2012. Retrieved 4 May 2018. ^ O'Connor M, Nilsson DE, Garm A (March 2010). "Temporal properties of the lens eyes of the box jellyfish Tripedalia cystophora". J. Comp. Physiol. A. 196 (3): 213–20. doi:10.1007/s00359-010-0506-8. PMC 2825319. PMID 20131056. ^ Meyer-Rochow VB; Reid WA (1993). "Cephalic structures in the Antarctic nemertine Parborlasia corrugatus - are they really eyes?". Amer Tissue & Cell. 25: 151–157. doi:10.1016/0040-8166(93)90072-S.
^ "Eye (invertebrate)". McGraw-Hill Encyclopedia of Science & Technology. 6. 2007. p. 790. ^ Vicki J. Martin (2002). "Photoreceptors of cnidarians" (PDF). Archived (PDF) from the original on 2013-10-05. ^ Zieger V, Meyer-Rochow VB (2008). "Understanding the cephalic eye of pulmonate gastropods: a review". Amer Malacol Bull. 26 (1–2): 47–66. doi:10.4003/006.026.0206. ^ Murphy, Richard C. (2002). Coral Reefs: Cities Under The Seas. The Darwin Press, Inc. p. 25. ISBN 978-0-87850-138-0. ^ Blest, AD; Land (1997). "The Physiological optics of Dinopis Subrufus L.Koch: a fisheye lens in a spider". Proceedings of the Royal Society (196): 198–222. ^ a b C. Bitsch & J. Bitsch (2005). "Evolution of eye structure and arthropod phylogeny". In Stefan Koenemann & Ronald Jenner (eds.). Crustacea and Arthropod Relationships. Volume 16 of Crustacean Issues. Taylor & Francis. pp. 185–214. ISBN 978-0-8493-3498-6. ^ Martin Wilson (1978). "The functional organisation of locust ocelli". Journal of Comparative Physiology A. 124 (4): 297–316. doi:10.1007/BF00661380. ^ Charles P. Taylor (1981). "Contribution of compound eyes and ocelli to steering of locusts in flight: I. Behavioural analysis". Journal of Experimental Biology. 93 (1): 1–18. Archived from the original on 2007-12-25. ^ Gert Stange & Jonathon Howard (1979). "An ocellar dorsal light response in a dragonfly". Journal of Experimental Biology. 83 (1): 351–355. Archived from the original on 2007-12-17. ^ Richard P. Berry, Gert Stange & Eric J. Warrant (May 2007). "Form vision in the insect dorsal ocelli: an anatomical and optical analysis of the dragonfly median ocellus". Vision Research. 47 (10): 1394–1409. doi:10.1016/j.visres.2007.01.019. PMID 17368709. ^ Joshua van Kleef, Andrew Charles James & Gert Stange (October 2005). "A spatiotemporal white noise analysis of photoreceptor responses to UV and green light in the dragonfly median ocellus". Journal of General Physiology. 126 (5): 481–497. doi:10.1085/jgp.200509319. PMC 2266605. PMID 16260838. ^ Richard Berry, Joshua van Kleef & Gert Stange (May 2007). "The mapping of visual space by dragonfly lateral ocelli". Journal of Comparative Physiology A. 193 (5): 495–513. doi:10.1007/s00359-006-0204-8. PMID 17273849. ^ Joshua van Kleef, Richard Berry & Gert Stange (March 2008). "Directional selectivity in the simple eye of an insect". The Journal of Neuroscience. 28 (11): 2845–2855. doi:10.1523/JNEUROSCI.5556-07.2008. PMID 18337415. ^ Gert Stange, R. Berry & J. van Kleef (September 2007). Design concepts for a novel attitude sensor for Micro Air Vehicles, based on dragonfly ocellar vision. 3rd US-European Competition and Workshop on Micro Air Vehicle Systems (MAV07) & European Micro Air Vehicle Conference and Flight Competition (EMAV2007). 1. pp. 17–21. ^ Müller, CHG; Rosenberg, J; Richter, S; Meyer-Rochow, VB (2003). "The compound eye of Scutigera coleoptrata (Linnaeus, 1758) (Chilopoda; Notostigmophora): an ultrastructural re-investigation that adds support to the Mandibulata concept". Zoomorphology. 122 (4): 191–209. doi:10.1007/s00435-003-0085-0. ^ Meyer-Rochow, Victor Benno (1974). "Structure and function of the larval eye of the sawfly Perga". 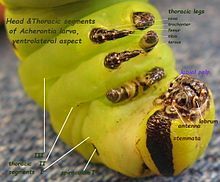 Jurnal of Insect Physiology. 20 (8): 1565–1591. doi:10.1016/0022-1910(74)90087-0. ^ Adriana D. Briscoe & Lars Chittka (2001). "The evolution of color vision in insects". Annual Review of Entomology. 46: 471–510. doi:10.1146/annurev.ento.46.1.471. PMID 11112177. ^ a b Markus Friedrich (2006). "Ancient mechanisms of visual sense organ development based on comparison of the gene networks controlling larval eye, ocellus, and compound eye specification in Drosophila". Arthropod Structure & Development. 35 (4): 357–378. doi:10.1016/j.asd.2006.08.010. PMID 18089081.